The response variable y can be either character or numeric. PROC LOGISTIC enumerates the total number of response categories and orders the response levels according to the response variable option ORDER= in the MODEL statement. The following example illustrates the use of PROC LOGISTIC. The data, taken from Cox and Snell (1989, pp. 10–11), consist of the number, r, of ingots not ready for rolling, out of n tested, for a number of combinations of heating time and soaking time. The following invocation of PROC LOGISTIC fits the binary logit model to the grouped data. The continuous covariates Heat and Soak are specified as predictors, and the bar notation (“|”) includes their interaction, Heat*Soak. The ODDSRATIO statement produces odds ratios in the presence of interactions, and a graphical display of the requested odds ratios is produced when ODS Graphics is enabled. The results of this analysis are shown in the following figures. PROC LOGISTIC first lists background information in Figure 58.1 about the fitting of the model. Included are the name of the input data set, the response variable(s) used, the number of observations used, and the link function used. The “Response Profile” table (Figure 58.2) lists the response categories (which are Event and Nonevent when grouped data are input), their ordered values, and their total frequencies for the given data. The “Model Fit Statistics” table (Figure 58.3) contains Akaike’s information criterion (AIC), the Schwarz criterion (SC), and the negative of twice the log likelihood (–2 Log L) for the intercept-only model and the fitted model. AIC and SC can be used to compare different models, and the ones with smaller values are preferred. Results of the likelihood ratio test and the efficient score test for testing the joint significance of the explanatory variables (Soak, Heat, and their interaction) are included in the “Testing Global Null Hypothesis: BETA=0” table (Figure 58.3); the small p-values reject the hypothesis that all slope parameters are equal to zero. The “Analysis of Maximum Likelihood Estimates” table in Figure 58.4 lists the parameter estimates, their standard errors, and the results of the Wald test for individual parameters. Note that the Heat*Soak parameter is not significantly different from zero (p=0.727), nor is the Soak variable (p=0.6916). The “Association of Predicted Probabilities and Observed Responses” table (Figure 58.5) contains four measures of association for assessing the predictive ability of a model. They are based on the number of pairs of observations with different response values, the number of concordant pairs, and the number of discordant pairs, which are also displayed. Formulas for these statistics are given in the section Rank Correlation of Observed Responses and Predicted Probabilities. 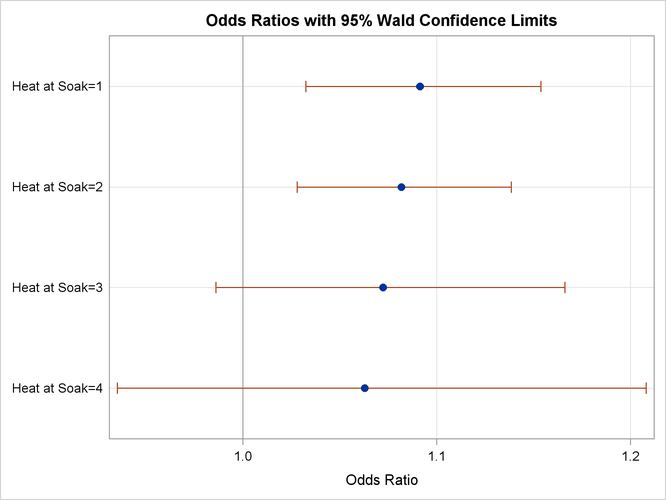 The ODDSRATIO statement produces the “Odds Ratio Estimates and Wald Confidence Intervals” table (Figure 58.6), and a graphical display of these estimates is shown in Figure 58.7. The differences between the odds ratios are small compared to the variability shown by their confidence intervals, which confirms the previous conclusion that the Heat*Soak parameter is not significantly different from zero. The results of this analysis are shown in the following figures. The model information and response profiles are the same as those in Figure 58.1 and Figure 58.2 for the saturated model. The “Model Fit Statistics” table in Figure 58.8 shows that the AIC and SC for the main-effects model are smaller than for the saturated model, indicating that the main-effects model might be the preferred model. As in the preceding model, the “Testing Global Null Hypothesis: BETA=0” table indicates that the parameters are significantly different from zero. The “Analysis of Maximum Likelihood Estimates” table in Figure 58.9 again shows that the Soak parameter is not significantly different from zero (p=0.8639). The odds ratio for each effect parameter, estimated by exponentiating the corresponding parameter estimate, is shown in the “Odds Ratios Estimates” table (Figure 58.9), along with 95% Wald confidence intervals. The confidence interval for the Soak parameter contains the value 1, which also indicates that this effect is not significant. This gives the predicted probability of the event (ingot not ready for rolling) for Heat=7 and Soak=1. Note that PROC LOGISTIC can calculate these statistics for you; use the OUTPUT statement with the PREDICTED= option, or use the SCORE statement. To illustrate the use of an alternative form of input data, the following program creates the ingots data set with the new variables NotReady and Freq instead of n and r. The variable NotReady represents the response of individual units; it has a value of 1 for units not ready for rolling (event) and a value of 0 for units ready for rolling (nonevent). The variable Freq represents the frequency of occurrence of each combination of Heat, Soak, and NotReady. Note that, compared to the previous data set, NotReady=1 implies Freq=r, and NotReady=0 implies Freq=n–r. Results of this analysis are the same as the preceding single-trial main-effects analysis. The displayed output for the two runs are identical except for the background information of the model fit and the “Response Profile” table shown in Figure 58.10. By default, Ordered Values are assigned to the sorted response values in ascending order, and PROC LOGISTIC models the probability of the response level that corresponds to the Ordered Value 1. There are several methods to change these defaults; the preceding statements specify the response variable option EVENT= to model the probability of NotReady=1 as displayed in Figure 58.10. See the section Response Level Ordering for more details.